It’s the middle of March and you are looking at your Q1 revenue forecast. Things are not looking good. The 2019 plan you put together last November calls for $15,000,000 for 2019 and for $1,153,848 for Q1. You are forecasting $480,770 or 41.7% of plan. 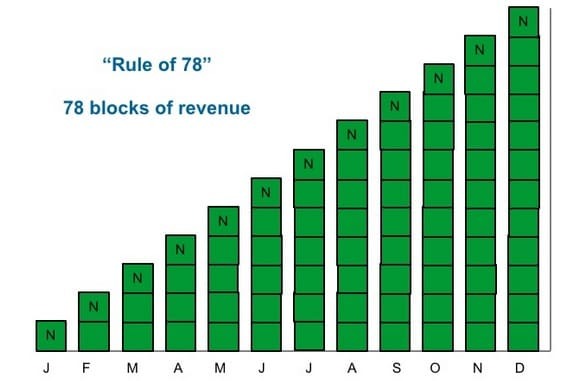 Has the Rule of 78 you used last year doomed your 2019 SaaS revenue plan? What are you going to do about it? Several things contributed to Q1 performance problems. Primarily, the sales team failed to deliver new billable customers with sufficient revenue each month as planned. New reps hired the previous October failed to be as productive as planned, two competitors launched the New Year with very aggressive new pricing programs that undercut your prices, and bad winter weather shut down the major industry conference in New York in January which historically had delivered big wins and new billings. Finally, a flu virus rolled through the main sales office in February that for three weeks took out more than half the team. None of these events could have been predicted last year when the revenue plan was put together. How did this happen and what can be done to recover so that the full year revenue plan can still be achieved? Even if after Q1 your team hits 100% of every monthly billing goal, your company is still going to miss its $15,000,000 target by over 21% or $3,269,236. In the “old” days before SaaS subscription revenue was the norm, software revenue consisted mainly of license revenue and maintenance revenue. License revenue was typically recognized on delivery while maintenance revenue was recognized ratably across the term of the maintenance agreement. Shortfalls in performance could be made up later in the year and really big deals could erase past deficits and even lead to over performance. Subscription revenues are a different beast. If you do not start billing new customers as planned early in the year it significantly impacts the entire year. You cannot simply make up under performance in one fell swoop with a big deal. ASC 606, the new revenue recognition and accounting standard that is in place now for virtually all software companies, further complicates things. Under ASC 606 subscription revenue is recognized over the expected lifetime of a customer, not the term of the agreement. For example, a customer signs a one year agreement for $120,000. Pre ASC 606, the company would recognize $10,000 a month for 12 months. Post ASC 606, the expected lifetime of a customer must be considered. If the average customer lifetime is 2 years, instead of recognizing $10,000/month, a company could only recognize $5,000/month. This reality further complicates the ability to make up for shortfalls early in the fiscal year. What Should You Do When Faced With a Big Shortfall Early in the Fiscal Year? It is easy to calculate what you revenue performance is – simply divide your actual results into your plan targets. Why is a different story. Sales and marketing professionals have their opinions about what drove particular customer wins or losses, but these opinions are often colored by their own preferential biases and a desire to either claim credit or deflect blame for specific situations. Win/Loss Analysis is a formal approach to interviewing and analyzing why customers did or did not purchase a solution from your firm. Win/Loss projects are usually performed by outside, independent, and neutral parties. Their goal is to document, from the customer/prospect’s perspective, why they made the decisions that they did. What business/team problem(s) were you attempting to solve when you decided to meet with [Vendor]? What was your role in the buying process – budget owner, other? Why, in the end, did you select [Vendor] as your vendor? What really appealed to you? How would you describe the overall buying experience? What other vendors and or approaches to solving this problem did you consider? How would characterize pricing and configuration relative to others you evaluated in your search? For example: What did the budgeting process look like, the timeline and the participants in the process. How did you learn about [Vendor] as a possible solution to your problem? How did you find other potential vendors? How did [Vendor] stack up against your other options? Were there any materials or information you felt you needed to help make the decision which didn’t exist/wish you had to aid in the decision process? What did you like or not like about [Vendor]’s product offering? What did you really like about the offering presented by your other options? Do you feel you obtained the value you expected from your purchase? What additional capabilities or solutions would you like from [Vendor]? If you had the opportunity to say anything, on any topic to the leadership what would you say? Would you select [Vendor] again? Hearing directly from customers/prospects is the best way to understand what is driving success and what can be done to improve the odds of success. Recruiting customers who have purchased solutions from your firm is usually pretty straightforward. Recruiting prospects who made a “no decision” or chose another vendor is more challenging. Sometimes offering an incentive, like a $25 gift card helps. Having a neutral third party also helps since prospects can avoid having difficult conversations directly with the sales and marketing people they worked with at your firm. To learn more about Win/Loss Analysis check out What is Win-Loss Analysis? MoneyWheel Analysis is a technique for identifying the repeatable types of sales transactions that occur in your business. Most technology purchases are triggered by some type of event that occurs in the marketplace or in a prospect’s business. A simple example of this is regulatory compliance. Y2K, Sarbanes-Oxley and GDPR are three regulatory events that led companies to invest in new software projects and solutions. Another example is the availability of new technology solutions. The explosion of Amazon Web Services has transformed the data center marketplace. Companies can now spin up sophisticated redundant, fault tolerant, and geographically diverse computing capabilities at a fraction of the cost of building out their own data centers or even a co-location data center. At any point in time, each software market has a number of events that occur that in turn drive repeatable sales transactions for vendors. MoneyWheel Analysis looks at these events and a company’s historical sales transactions to learn where to focus sales and marketing resources. Here is an example of a MoneyWheel Analysis for a marketing automation software provider. The categories are the broad types of sales transactions (Net New Customers, Add-on Product Sales to Existing Customers, Expansion Sales to Existing Customers, etc.) and the spokes are the types of repeatable sales transactions that occur. For example, Mergers/Divestitures often trigger the purchase or consolidation of marketing automation solutions. By plotting how well each rep/region performs by Moneywheel category/spoke you can identify which reps are succeeding in a specific niche and which are struggling. You can then focus on scaling the success of the top reps to other reps and remediating the challenges that underperforming reps are having. When faced with a revenue shortfall, firms can look at scaling up the types of successful sales transaction types that discovered through MoneyWheel analysis. To learn more about MoneyWheel Analysis, check out Moneywheel – A Revenue Sourcing Analysis Technique for Product Managers. Sales reps and sales managers are some of the best examples of self optimizing behavior – they will do the least amount of work to earn the maximum incentive they can. The Harvard Business Review published a great article on How to Really Motivate Salespeople that delves into what types of compensation programs effectively motivate salespeople. When faced with a subscription revenue shortfall early in the fiscal year management faces a difficult challenge. Underperforming sales is usually the primary driver of revenue under performance. Sales reps that have underperformed face a real chance of developing what is known as second-half-itis. Since most sales plans offer increased payouts for quota over performance, if a rep feels that they have no chance of achieving those payouts they will tend to slow down their sales activities and defer closing business until the next fiscal year when the sales would contribute more to their ability to achieving superior compensation. This often happens in the second half of a fiscal year, and especially in the last quarter of the year. Offering a Spiff, a special one-time payment for immediate sales, can seem counter-intuitive. The reason a company is having problems is that the sales force did not perform according to expectations. Offering a reward for essentially doing the job they were supposed to seems unfair. The nature of subscription revenue sales however dictates that management seriously consider this option. Unlike the old days of license revenue sales, underperformance in a specific time period cannot be made up in via lump sums later in the fiscal year. Once a month passes where no subscription revenue was generated for a particular customer, that time and revenue cannot be reclaimed. Management has to balance the increased costs that Spiffs present against the value of having revenue delivered when it was expected. Spiffs are not a panacea for solving sales underperformance, but they can help get out of a specific jam. If Spiffs are offered too often, sales reps will develop a tendency to slow deals down until a Spiff is offered. This will in turn make the underperformance issue larger and lessen the effectiveness of the existing sales compensation plans. Revenue underperformance, especially early in a fiscal year, can have significant consequences for subscription revenue driven firms. There are three tactics firms can use to combat such a situation: Win/Loss Analysis, MoneyWheel Analysis, and Spiffs for sales reps and sales management.